GRAMBLING, La. – The Board of Supervisors for the University of Louisiana System today named Willie D. Larkin as the ninth president of Grambling State University. Larkin, Chief of Staff to the President of Morgan State University, is expected to assume the presidency on July 1. Larkin thanked the board and the Grambling community. “I’ve been working for this my entire life. I thank my mom and dad. Although they’re not living anymore, they’d be extremely proud,” he said. Larkin was among five candidates who interviewed publicly on the Grambling campus this week. A search committee, appointed by the UL System Board, consisted of board members, students, alumni, faculty and community representatives. After interviewing semifinalists, the Board selected two candidates for final interviews today in front of a diverse university audience. In his interview, Larkin stressed the leadership and collaboration skills he’s honed in the decade he served as Chief of Staff to leaders of Morgan State and the University of Wisconsin Colleges, as well as his experiences with the Faculty Senate and University Senate at Auburn University. Despite a modest background, Larkin explained, his opportunities have inspired him to seek similar opportunities for others. “Coming from an agricultural rural background, the oldest of eight children, born to uneducated parents and getting the opportunity to leave that sharecropper farm and go to college and get a college education, most people would say, ‘You’re really not supposed to be where you are. You’re not supposed to have accomplished what you’ve accomplished,'” Larkin said. “So based on my experience and the opportunities I’ve had, I would love to provide that opportunity for more young people. I think I’m a great leader. I think I have a great influence on people. So I’d like to come to Grambling and get an opportunity to demonstrate that my kind of leadership works, my inspiration works, my enthusiasm, my motivation and I think that I can lead by example,” he said. The former Kellogg Fellow earned his doctorate in Agricultural Education Extension from the Ohio State University, where he specialized in 4-H and Youth Development. He earned both a bachelor’s and master’s degrees from Tuskegee University. Click here for his bio. Voting members of the Grambling Presidential Search Committee included UL System Board members Edward Crawford, III of Shreveport, Kelly Faircloth of Pineville, David Guidry of Natalbany, Board Chair E. Gerald “T-Boy” Hebert of Kenner, student board members Adam Lefort of Nicholls State University and Maggie Brakeville of Louisiana Tech University, Jimmy Long, Sr. of Natchitoches, Board Vice Chair Jimmie “Beau” Martin, Jr. of Cut Off, Shawn Murphy of Jonesboro, Mark Romero of Lafayette, and Winfred Sibille of Sunset. 1. 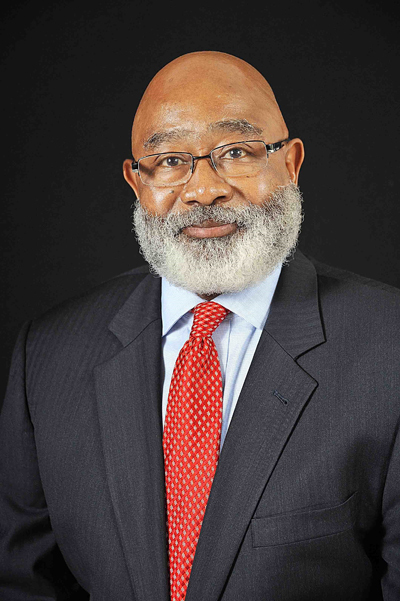 Also serving as a voting member is Grambling Faculty Senate President Herbert Simmons. Serving as advisory, non-voting members were Grambling National Alumni Association President Melissa Bickham, Grambling SGA President Jonathan Wallace and Grambling community representatives Howard Davis, Wilbert Ellis and Mildred Gallot. UL System President Sandra Woodley serves as non-voting committee chair.